It's rare for someone like me (with sensitive skin) to come across a scrub that is not just gentle, but also extremely hydrating. 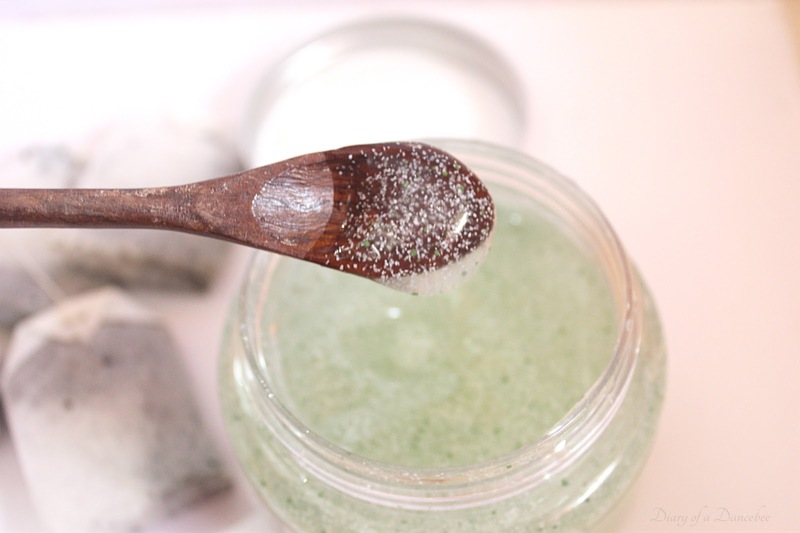 So far, I have always stayed away from trying body scrubs, because they often lead to de-hydrated, dry skin. 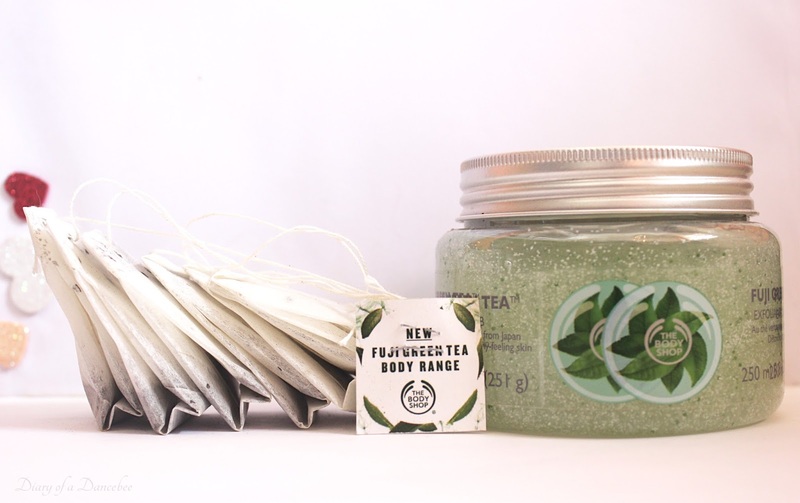 And when The Body Shop recently launched their all new Fuji Green Tea collection and sent us products from the range, I thought I'll give the scrub a miss. But while checking out the texture of each product, I was quite impressed with this scrub and curious to know if it will change my perception. Curious that I am, I decided to take a risk and test The Body Shop's Fuji Green Tea Body Scrub. The result (and honest opinion) - I am hooked, and how! What does it promise? 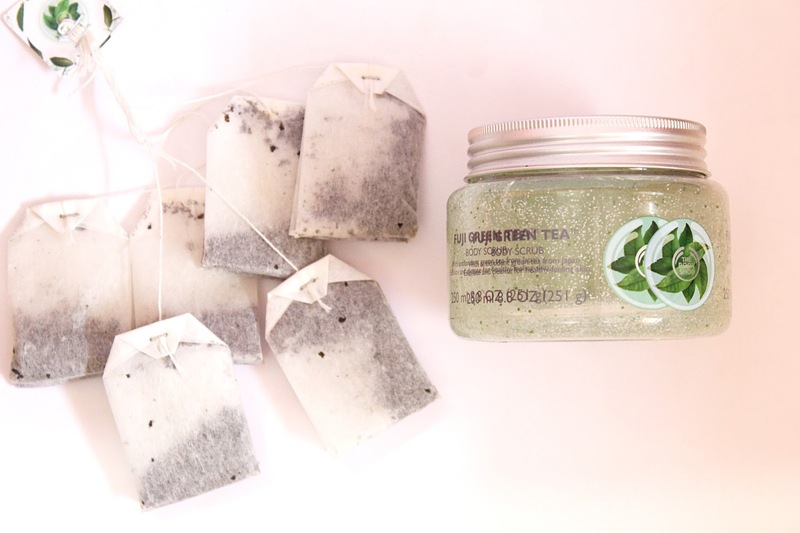 The product perfect for cleansing and exfoliating, the crisp and refreshing scent of Fuji Green Tea™ Body Scrub helps to lift away dead skin cells, detox the body, and prepare skin for moisture. 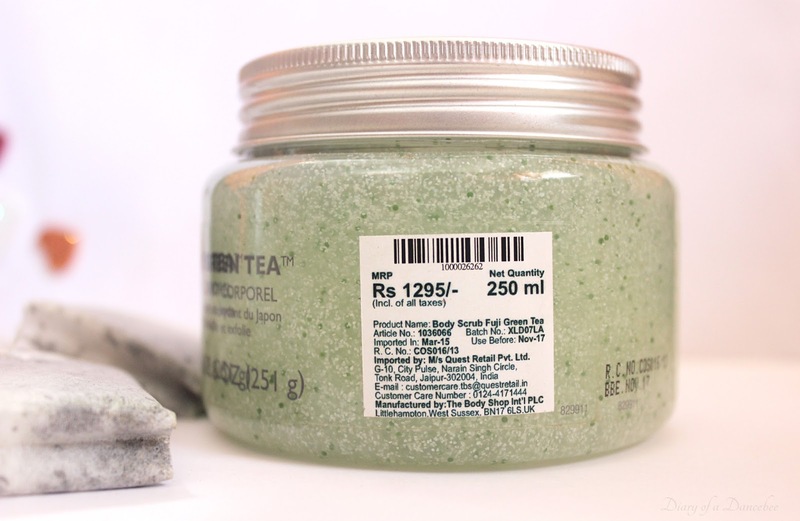 The Green Tea range of products helps in lifting away dead skin cells. 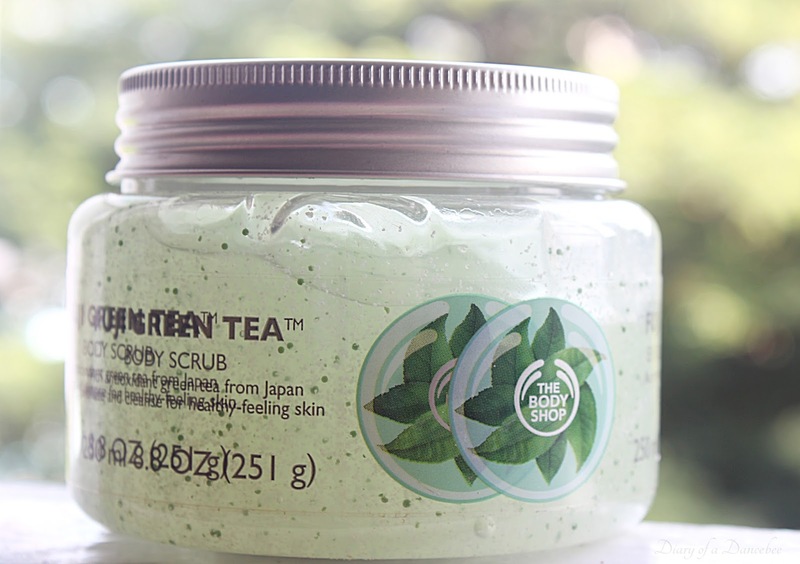 Infused with replenishing green tea from Japan, which helps you get healthy looking skin. Enriched with Community Fair Trade Honey from Ethiopia. How to use? - Use a spatula or spoon to get the required amount of product in your hand (I prefer using it this way, as it does not waste any product and this process is hygienic). Apply to damp skin in a circular motion, then rinse thoroughly for refreshingly smooth skin. For best results, use two to three times a week. Packaging: A sturdy plastic jar, which is transparent (and cute). The product is easily visible through this jar, so you can keep a tab on the amount that you are using. The metallic cap fits well and ensures that the product does not spill. Safe to carry while traveling. 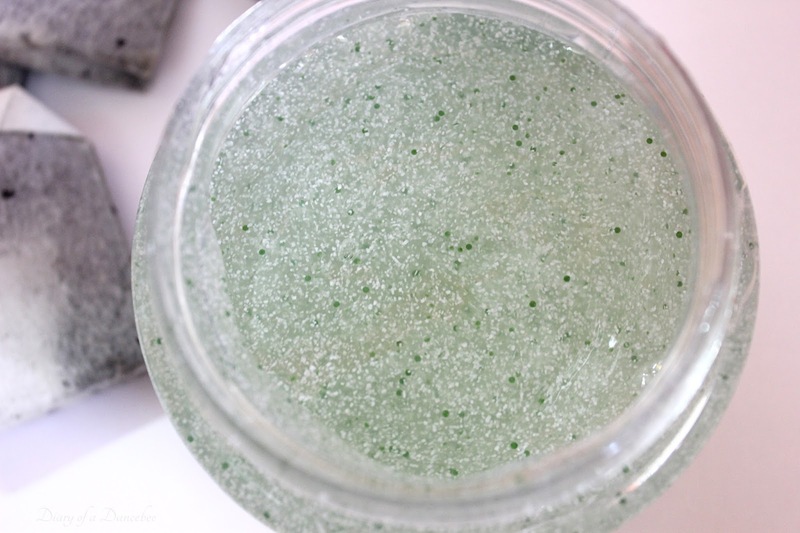 Texture: Smooth, gel based scrub with micro-granules. The granules are not harsh and the product is extremely light weight. Overall Experience: This is exactly what I was looking for! A light weight, gentle scrub that does its job well, without drying your skin out. Right from the delightful fragrance to the texture, packaging and introducing a refreshing ingredient like the Fuji Green Tea, The Body Shop has nailed it in every department. The product starts working the moment you start massaging it on your body in the shower. Within minutes, you start feeling relaxed, hydrated and squeaky clean; all this, right after the first use! 2-3 trials later, I was in love. I noticed that the scrub helped in exfoliating and ensuring that my skin remains soft, while getting rid of the dead cells (this is where the gel + micro-granules formula comes to the rescue) and even some pesky in-growths. What’s also amazing is the fact that a little product goes a really long way, which means, the jar will last you for a good 6-7 months, depending on the way you use it. Honestly, using this scrub feels like a trip to the spa. And the best part? It works well on all skin types. One of our team members, who has oily skin, tried the scrub and made a trip to the TBS store to pick up her own jar. Now you know what I mean by getting hooked on, right? Verdict: The Body Shop's Fuji Green Tea Scrub has fast become one of my favourite skincare products. I am totally stocking up on this, and so should you! Have you tried any product from The Body Shop's Fuji Green Tea range?